What do you do when you get home from a luau featuring a limbo contest and a surf-thrash band? 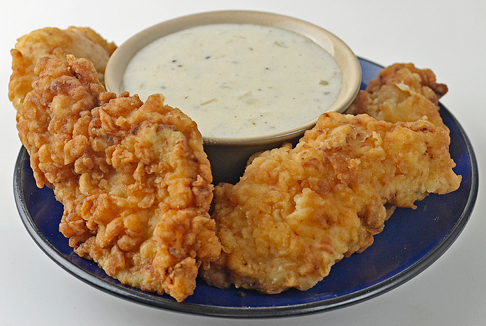 Make a batch of country-fried chicken and a side of pepper gravy is what you do! That's what I did anyway. I've been out and about in Austin lately feeling out the music scene in search of some like-minded musicians. Saturday was one of those nights. After a couple hours hanging with the head-banging beach crowd at Hole in the Wall club near the UT campus I decided it was time to get home and make a snack. I had eaten a huge breakfast plate for what normal people consider a late lunch/early dinner in the afternoon and wasn't really hungry before heading to the luau. By midnight I was ready for some grub. I was planning to save the majority of the chicken for lunch the next day and just have a couple strips for a late night snack to tide me over until morning. After sampling a strip dipped in the gravy I couldn't resist though and just kept going back – I was like a moth to a flame. All told, I destroyed six of the 10 strips I made and a good amount of the pepper gravy. There are two keys to making this dish. Great breading and tasty gravy. Knowing how to whip up a gravy as a side compliment to the main event is really the difference between putting out good food and great food. It takes a minimal amount of practice and adds some heavy artillery to any cook's culinary arsenal. Here it was key. The breading on the chicken was just how it was supposed to be, but the gravy, Oooooh that gravy! Peppery, garlicy and absolutely the bomb – that's what kept me going back. Surf-thrash, limbo and country fried chicken with ridiculous pepper gravy. Not the perfect Saturday night, but a good one none the less. In a large bowl submerge chicken in buttermilk, cover and place in refrigerator. Let marinate at least one hour. In a small pan over medium heat, saute onion in melted butter until soft, 3 to 4 minutes. Salt and pepper to taste. Add garlic, cook one minute, or until fragrant. Stir in flour until completely absorbed by butter. Let cook three minutes or until slightly brown in color. Stir in milk. Bring to a boil and let thicken. Remove from heat and keep warm until serving. In a large pot heat enough oil to submerge chicken strips to 350°. While oil is coming to temperature set up breading stations. In one pan or bowl beat together eggs, water and hot sauce. In a second pan or bowl, mix together flour, baking powder, salt and pepper. Remove chicken from buttermilk and let drain. Coat in egg mixture then dredge in flour until completely coated. Place in oil until cooked through and golden brown, 4 to 6 minutes. Remove from oil and drain. Serve chicken with gravy for dipping. Pasta and cheese go together like yin and yang. Add ground beef and you get shamalama ding dang! I bought a 3-pound package of ground beef on sale that I divided for three meals. The first of which was this scatch-made, hamburger-helper-esk pot of yummy goodness. I made this for dinner and two meals throughout the week but it will easily feed a family of four. This is a very straight forward recipe with one element that needs special attention - the sauce. The key to it is patience. I use a roux made from the drippings of the ground beef as the base. Let the flour and fat cook together with the mirepoix for a couple minutes before adding the milk. It should turn a little browner during the process. The flour and fat need the heat to change chemically to become a thickener. Then add the milk and let the mixture simmer until it's noticeably thicker. Finally, add the cheese a little at a time and make sure it's completely melted before adding more. Nailing this processes will make this simple, kid-friendly meal a hit with everyone. That's some Shamalama ding dang! Cook pasta according to package directions. Drain set aside. In a 4 quart pot over medium heat, brown ground beef. Salt and pepper to taste. Remove to bowl with slotted spoon, set aside. In beef drippings saute onion and green pepper until soft, 3 to 4 minutes. Salt and pepper to taste. Add garlic, cook until fragrant, 1 minute. Stir in flour, let cook 2 to 3 minutes. Stir in milk and simmer until thickened, 3 to 4 minutes. Add cheese a handful at a time, stir until melted, repeat until cheese is gone. 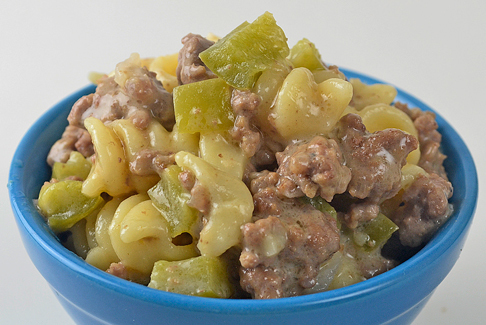 Return beef to mixture and add rotini. Heat through, then serve. I can plate up some mean biscuits and gravy, pancakes, frittatas, omelets and many other breakfast favorites but I had never been any good at making a fried egg over easy. Broken yolks and a glob of egg is how they usually ended up — which in turn would become scrambled eggs. One of my goals in the kitchen over the last few months has been getting better at eggs over easy, so basically, I have made 2 of them for myself nearly every Saturday and Sunday since February. I might not be able to make them like Bobby Flay at this point, but I have learned to plate up a quality "dip" egg with a nice runny yolk and beautiful whites that feature tiny flecks of pepper. The secret to a nice egg over easy? A thin, metal spatula. I'm sure there are armies of people who use thick-plastic spatulas sold in big box-store bundles that turn out wonderful eggs, but for me, the right equipment was essential to get the eggs I wanted every time. The right spatula allows me to get under the egg for the flip in a nice quick thrust, once its on the spatula, turning it over is a breeze. It's the getting under it part that would always screw me up. 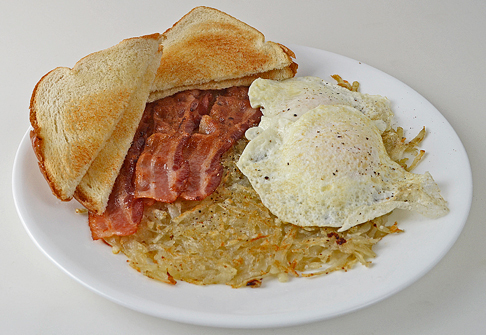 Two eggs over easy served on a hash brown with bacon and toast is morning bliss. That's what my Mom would often cook for us on weekends growing up. The eggs were holding me back from making it a breakfast staple for myself and whoever I cook for — but I can proudly say "not any more." It took about 86 fried eggs to get it right. Sometimes you just have to be committed. If you're in the Austin area on a given weekend morning — stop by — I'll make you some eggs over easy to get the day going.